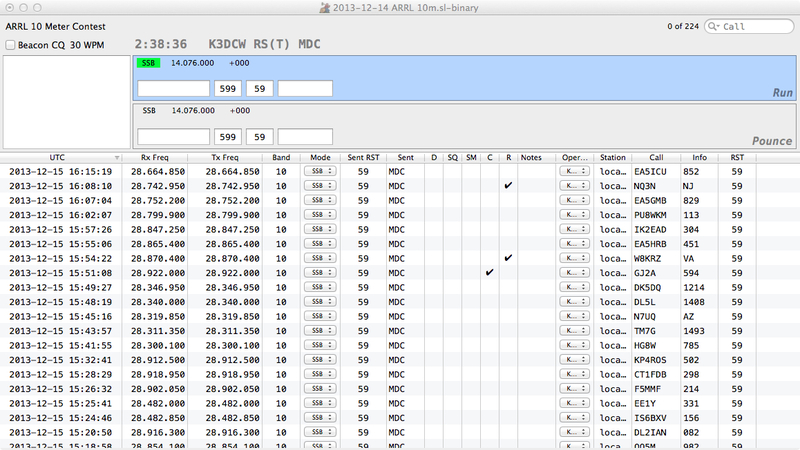 Bill Myers, K1GQ, released version 2.3.2 of his contest logging software SkookumLogger for macOS. Crash when attempting to create a new log for the RSGB 80m CW Autumn Series contest — which happens tomorrow. Thanks GW4OKT. The approach in 2.3.0 for adding explicit support for modes beyond the only two contesting modes that matter turned out to be flawed. This release has many more changes that attempt to clean up the mess. SkookumLogger now support six modes: CW, SSB, FSK, PSK, Data, and FM. The available modes for a particular radio are listed in the Radio ► Mode ► submenu. Typing the mode name into the call field with transmit focus is a shortcut for changing the radio mode. The text command is ignored if the radio doesn’t support the mode. The FT-847 and FT-2000 now radio modules support (narrowband) FM. Thanks GØDVJ. The Pass Information window and the Score window have per-mode columns for mixed-mode logs. Added contests: ARRL RTTY Roundup, RSGB 2m FMAC, RSGB 40m QSO Party. The content of the partials field was sometimes not cleared after logging a QSO. Thanks GØDVJ.